“What’s your new year’s resolution?” Not sure how many of you encountered the same question over the last few weeks, or how you responded. Personally, I’ve never been a fan of resolutions. A friend approached me with this question and I shared with her a quote I came across a few days prior. This sparked a discussion about how we set such high expectations for ourselves. We want to feel successful in so many areas of our lives (at work, at home, in relationships, etc. ), and in turn, we tend to feel unsuccessful because we can’t meet every expectation. But, if we look at the value we provide (to our families, friends, co-workers, organizations, etc. ), it might elevate how we see ourselves. We can remove the skewed perspective we may have of success and focus instead on the value we bring to our relationships and experiences. ATD-MAC’s 2018 focus is to provide you with value. We want to give you applicable and enlightening experiences that support you in providing value in your lives. Whether it is through attendance at our monthly events, volunteering with the chapter, or joining the board, we want to inspire you to find and provide value. Our January 25th, State of the Chapter will provide you with an overview of the chapter and some of our upcoming events. We’ll have time to network, share stories, and information to start the new year off right! 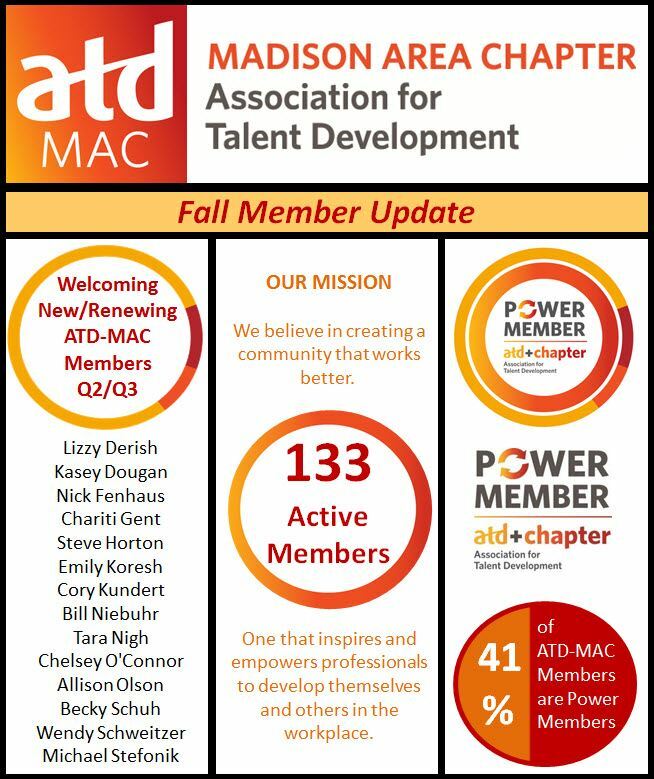 To ensure you receive the full value of your membership, I encourage you to check your account (ATD-MAC and National if you are a power member) and make sure all your contact information is updated, including email and mailing address. Please don’t hesitate to reach out if you have questions about the chapter, want to get involved, or are interested in connecting. A while back my team was restructured with the goal of elevating our status within the organization and to better serve its needs. Before the restructure we were a team of trainers; after it, we were a group of people with different responsibilities and a whole new mission. We previously handled onboarding and ongoing development for our sales organization, and functioned as instructional and training designers, product and sales processes SMEs, coaches, sales support, you name it. The makeup of the team looks very different now. We still have one or two contributor roles, and most of the team members are Program Managers; Training and Development (me), Content and Assets, and Communications and Events. While each of our responsibilities is different, our mission as a Sales Enablement team is to be the conduit and catalyst to enable our sales organization to get sales done. If it sounds altruistic, it is. What mission statement isn't? With our mission statement as our guide, our challenge was to figure out how we stayed within the guard rails of program management and fulfill our mission. Since we added two new team members, we decided to do a team building workshop. We waited long enough so that the new team members had a lay of the land, but not too long where it would lose its effectiveness. We took a full-day away for team building and strategic planning. There were many excellent take-aways from that day. For starters, we walked away with a better understanding of each other’s strengths, experiences, and insight into how we think, solve problems, etc. Second, we established our bodies of work by program (i.e., training and development, content and assets, etc.). 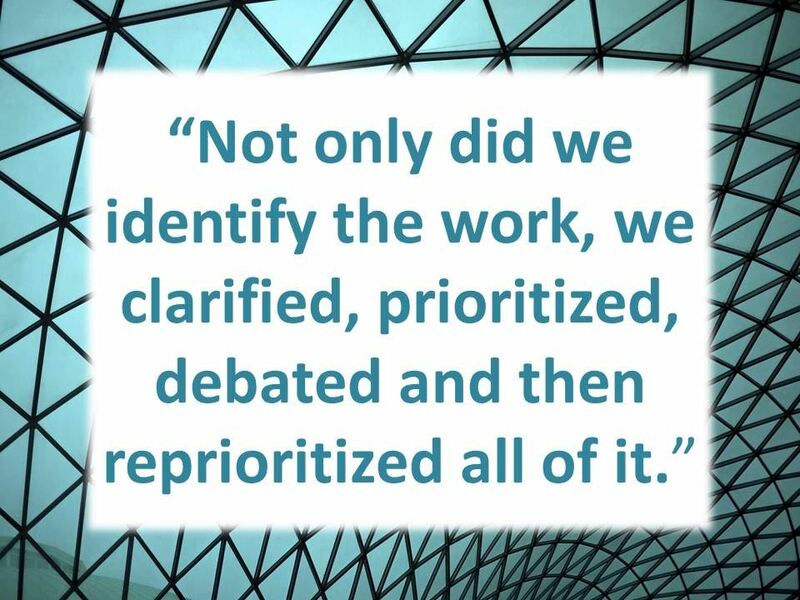 Not only did we identify the work, we clarified, prioritized, debated and then reprioritized all of it. In the end, we walked away with a clear and more prioritized body of work that we could start actioning right away. One of the most enlightening take-aways from that activity was seeing how each person’s role played a part in very different projects. To continue the momentum, it is critical that we continue to meet as a team. We established a three-tiers meeting structure. A formal team meeting every other week, a 15-20 minute huddle twice a week, and weekly one-on-ones. In our formal team meetings every other week, we share updates and discuss our top priority projects, regardless if they're in progress or still in planning. At our twice a week huddle, we meet informally for 15-20 minutes to update each other on what we're working on that week, ask questions to team members, and uncover barriers. And, for our once a week one-on-ones, the goal is primarily for the team member to talk through challenges, seek advice or coaching, get direction, feedback, really anything. Sometimes, this entails discussing things that were also discussed in the team meeting, but it allows the team member to gain more guidance and feedback on possible solutions that were discussed. For us, it was important to “own” the restructure. In order to be successful, we had to be mission-driven and take time to pattern and prioritize our work around that mission. By making sure we are all working toward the same goal and checking-in with each other often, we’ve been able to actualize our mission while also moving closer together as a team. Marc is an engaging talent development professional with wide-ranging experience in adult learning, facilitation, leadership, technology, and training development. He has 15+ years of experience developing and delivering training content to new and experienced employees, coaching, and leading teams in challenging and dynamic organizations. He currently works at Renaissance, a K-12 educational technology company, as the Program Manager, Training and Development for their sales organization. Marc holds an undergraduate degree in Organizational Behavior and Leadership from Edgewood College. Outside of work he enjoys spending time with his wife and two young boys, being outdoors, dabbling in photography, playing acoustic guitar, reading non-fiction, using technology, and watching sports. December’s ATD-MAC theme is Authenticity. Today, Erin Lavery finishes her two-part series on her year-long journey to build Authenticity in her work and life. In Part One, Erin shared the commitments she made to better understand herself. In this second part, Erin shares the 4 commitments she made to better understand others. 1. I will be curious first. 2. I will show up for today only. 3. I will believe I am worthy now. 4. I will right-size situations. 5. I will wait to act. 6. I will act from what I value and not what I fear. The commitments I had made started to change the way I interacted with and understood myself in my work. But, if I was going to avoid another crisis, I needed to change the way I interacted with and understood others in my work. As I started to navigate and change my view of myself, it started to have a profound impact on how I viewed others. 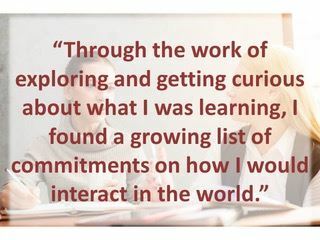 Through the work of exploring and getting curious about what I was learning, I found a growing list of commitments on how I would interact in the world. 7. I will speak up when I don’t know or understand something. Not only does this often clarify misunderstandings that lead to conflict, but it always puts me in the best position to always learn and master new skills. By admitting I don’t know, I have come to know more and gain more skills than I ever would have otherwise. That being said, it’s terrifying and every time I have to repeat Commitment #3 over and over again. 8. I will trust in the wisdom of crowds. In his awesome book The Wisdom of Crowds: Why the Many Are Smarter Than the Few and How Collective Wisdom Shapes Business, Economics, Societies and Nations, James Surowiecki not only wins the award for longest book title, but he also shares the Parable of the Ox. The parable tells the story of a county fair that had a challenge to guess the weight of an ox. None of the individual guessers got the right weight; however, when all the guesses were averaged together, the crowd as a whole came up with the right weight. The truth here is: when we work together, we get closer to the ideal. That is, collaboration always leads to better design and outcomes. Whenever I find myself holding something too tight or too close, I force myself to send it to someone else for review/input. Doing this keeps me honest about not allowing a project to become about MeMeMe (see Commitment #4), but it also leads to better ideas and innovations while opening me up to opportunities to learn from others. 9. I will assume the best intent. My first reaction to a comment or situation may be distrust or anxiety, but I make a conscious effort to amend my story of the person and assume they have the best intent. When this is extremely difficult, I default to the question a brilliant colleague of mine uses. “What if they are doing their best today?” What if the other person is doing their absolute best in the situation to communicate clearly, be authentic, and get good results? If I assumed that to be the case, how would I feel differently about their actions? Sometimes this mindset change takes me while, but that’s okay because of Commitment #5. 10. I will be authentic in my connection and communication. When I am hurt, angry, fearful, excited, grateful, or thankful, I will say so with respect and with the goal of connection. I will make the choice to choose connection, authenticity, and honesty over trying to protect an image of perfection. My challenge to myself is this: If I see an opportunity to make a connection or be vulnerable, I will take it even if it’s scary (see Commitment #6). So, it’s been almost a year. Here’s what happened. I’m happier. I’m more creative. I’m more daring. I actually am more what I was trying to be before all of this started. Have I disappointed people? Probably. Do people know that I am messy and less than perfect? Yup. But, they also know that I’m going to keep trying and showing up every day no matter how many times I fall. They know that when they don’t know something, I won’t judge them. They know they can approach me. They know we can muddle our way through together, make mistakes, laugh at ourselves, and do more amazing things than we could if we weren’t being human together. I won’t tell you it gets easier. It doesn’t. It’s still horrible and uncomfortable and tiring and scary and courageous and brave and wholehearted. But, hey, according to Commitment #2, I only have to do it for today, right? Click here to download a free poster of Erin’s “10 Commitments to Something New”. 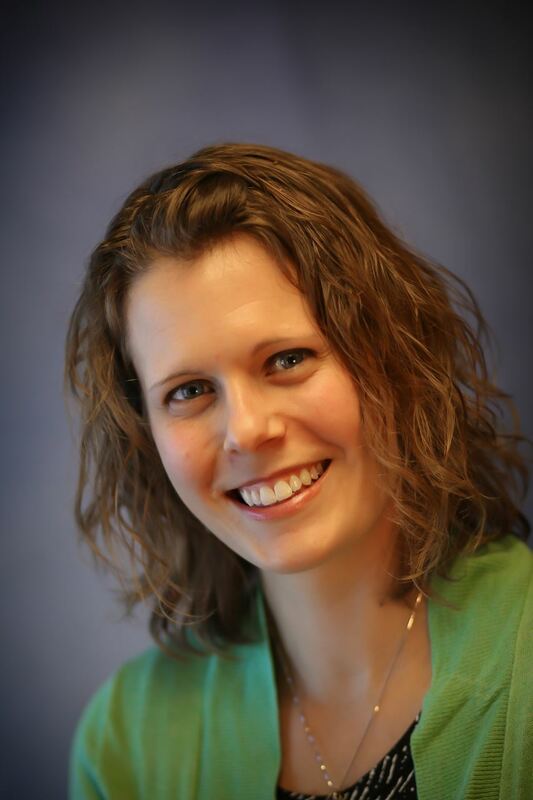 Erin is a Learning & Development Specialist focused on Leadership Development at UW Health. She holds a Master of Science in Adult and Continuing Education Leadership through the University of Wisconsin – Milwaukee as well as a Bachelor of Arts degree in German Literature and Pedagogy from Calvin College. In addition, Erin is a certified trainer for Development Dimensions International and Crucial Conversations as well as a certified Life Coach for students with disabilities. Erin currently serves as the VP of Marketing for the ATD-MAC. December’s ATD-MAC theme is Authenticity. In this two-part series, Erin Lavery shares how she went from crisis to a new normal on a year-long journey to build Authenticity in her work and life. In Part One, Erin focuses on the crisis and beginning the journey. She shares 6 of the 10 commitments she made to herself to find better relationships, results, and realness in her work. One year ago, I sat in a meeting at work where everyone (myself included) dug in a bit too much and it got messy and uncomfortable. On a stress scale of 10, I was a 17, and I realized in that moment that I had to make a choice. Either I could make a conscious effort to radically change my approach to work, or I could dive head first into total and complete burnout. Let’s back up a bit and I’ll give you some history. I’m a chronic do-er. StrengthsFinder calls it an Achiever. I call it waking up every morning at zero and needing to earn my right to a ten out of ten (or higher, I mean, let’s not limit ourselves after all). Brene Brown calls it a “hustle for worthiness”. I have lived my life firmly and totally believing the lie that my value is derived from my ability to be the best fill-in-the-blank [Best worker. Best designer. Best facilitator. Best wife. Best mother. Best friend. I have always operated under the assumption that if I was the best, I could hustle my way past Imposter Syndrome and into real worthiness. I imagined I would wake up one day and feel like I had finally earned it (respect, value, intelligence, you name it). So, back to the pivotal meeting. I was presenting a program design that I had put my whole self into. In my mind, this wasn’t just a program. It was the quintessential representation of my Best Self. It was the Thing that would catapult me to worthiness. As you can imagine, it didn’t go well. People had questions, feedback, ideas, opinions . . . all those benign things that people have that make end products better. And. I. Lost. It. Inside. Every suggestion wasn’t a suggestion. It was a challenge to my ability … my knowledge … my worthiness to be at the table. And I believed it. I was left beat-up, broken, and raw. And here was the moment of choice: Either I shut down, or I change up. I chose to change up. From curiosity, I dove into showing up. From showing up to worthiness. From worthiness to authenticity. And on and on. And every moment I make a choice for the following growing list of things. 1. I will be curious first. Instead of judging or trying to change what I am thinking, I will get curious as to what I’m thinking/feeling and why. I will not try to change it. I will only be curious about it. 2. I will show up for today only. Every morning when I wake up, I wake up for that day and not all the others in the future. This commitment came when I decided to start running again. My immediate thought was “when am I going to do it? Should I wake up early every morning? Run after the kids go to bed? I have to plan this out.” And it turns out, I don’t. I just have to do it today. 3. I will believe I am worthy now. Brene Brown said it best when she wrote, “Worthy now. Not worthy if. Not worthy when. Worthy now.” When I’m at work, I will believe I am enough. When I am able to do this, I put down the burden of trying to prove myself and open myself to more creativity, productivity, and connection. 5. I will wait to act. Just recently, a friend told me “The more chaotic things are, the more still I get.” When something happens and things feel chaotic, I am forcing myself to wait a day, an hour, sometimes just 10 minutes before I act. You won’t believe me until you start trying it, but you would be amazed at the number of great innovations that surface when you wait just 10 minutes to act, reflect, and get curious. 6. I will act from what I value and not what I fear. When it is finally time to act, I have made a commitment to choose the action that fulfills and restores what I value rather than simply avoids what I fear. This started with having to understand what I value and what I intend to build in the world with the time that I have. Join us next week for Part Two of “A Year of Authenticity” as Erin shares the 4 commitments she made to her team that led to more fulfillment in her work and better outcomes for her organization. ATD-MAC is focusing on Authenticity throughout December. If you haven’t already done so, take a moment to register for ATD-MAC’s December program “Authenticity in Teams” featuring Roger Wolkoff. Roger will be teaching leaders how to achieve greater team results with Authenticity. Throughout the month, we also have a fantastic line-up of featured writers for the ATD-MAC Blog that will be focusing on their journey with authenticity as Learning & Development professionals. I’m thinking of that now as I feel myself “drowning” in a sea of technology, apps, gadgets, and information that I barely know how to use. It’s difficult to figure out what to immerse myself in and learn how to use, knowing that some of the choices I make will prove to be irrelevant way too soon. Do you ever feel that way? There are days when I feel like a Luddite wanting to chuck everything I’m not familiar with. You take the apps, the Snapchats, the memes, and whatever else launched and went viral since I began writing this. I’ll keep my website, email, LinkedIn, webinar platform, and PowerPoint. I can get by with those, right? Deep down, I know I’m losing out on things that could help me and our business to have a greater reach and effectiveness. But there is so much and so many different options! What makes it all the more upsetting is I actually really enjoy learning about the latest and greatest tech stuff. Nothing gets me more in “the zone” than needing to learn a new piece of software for a new kind of project I’ve embarked upon. But I get frustrated in only having the opportunity to learn as much as I need to get the project out the door. I rarely feel like I’ve mastered all of the features, whistles, and bells of any given program. So, how are we going to do it? How are we going to find the time, resources, energy, and understanding to know where to lean in, figure it out, and discover something new? How are we going to know what tech is worth pursuing and what we should pass by? I think the answer lies in concerting our efforts and being comfortable to share. When we start to lean on our professional community, like ATD-MAC, and synthesize our efforts, we start to find efficiencies and give tech a run for its money. So, no more holding back with reviews of stuff! We, as a community, need to hear the good, the bad and the ugly when we’re sharing our opinions. Remember, this is the lifesaver that keeps us from drowning in tech, saves our time, and limits our frustration. That said . . . I found this cool app and I have it on my phone. I just can’t figure out what to do with it, but it looks darned cool. It’s called Adobe Capture. (Maybe I’m years behind, but it seems like this could be very useful to an ambitious ID.) It uses your phone’s camera to capture shapes, color pallets, materials typeface/fonts, patterns and brushes and saves them or converts them to other useable formats. 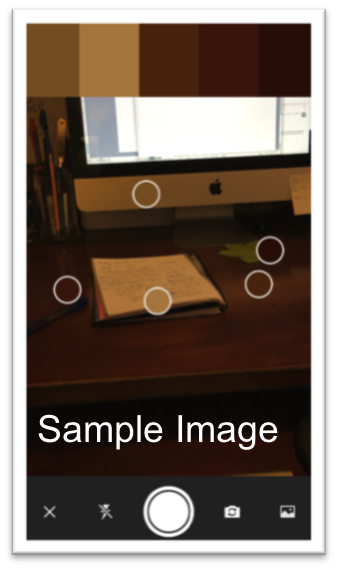 The image on the right is a sample of what I took from my phone at my desk (in poor light). What cool new gadgets, apps, features, or tech have you found recently? What about it was worth your time? How could you see it being used? Feel free to use the comments feature below or reply to our Social Media. Let’s keep this conversation going! 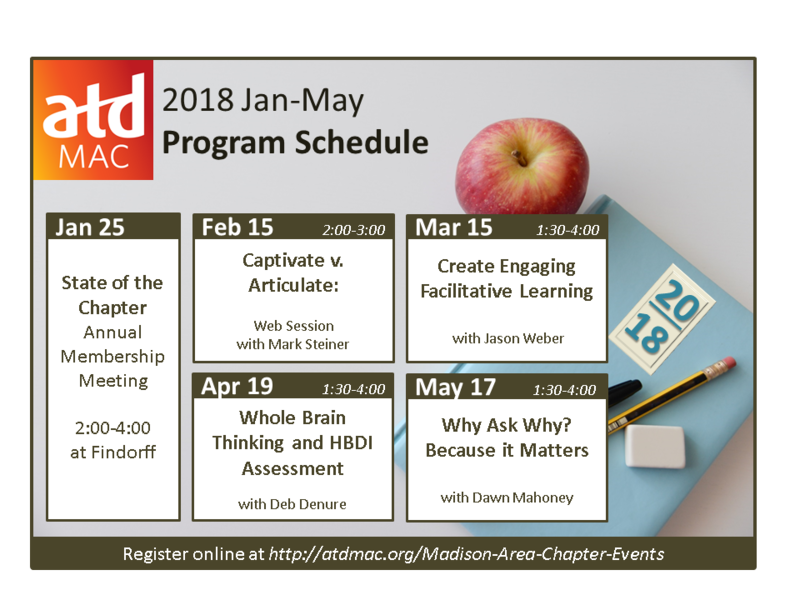 Comment to this blog post, tag us on twitter @atdmadison, or post on ATD-MAC’s LinkedIn and let us know what you’ve been using and whether it’s worth our time. 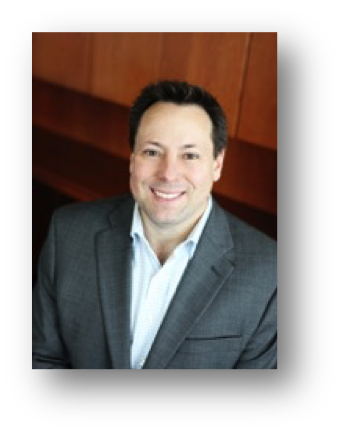 Kevin is publisher/consultant for TEAM Resources, a small consulting firm that provides strategic planning and training services primarily for the credit union industry. You’ve heard it a hundred times. Continuous learning is critical to your talent management strategy—and your organization’s bottom line. To that end, an essential investment is a powerful learning management system (LMS) and social tools, not to mention great content. But, 66% of learning and development (L&D) professionals say they still have trouble getting employees to engage with corporate learning, and the problem is even more pervasive for virtual teams. So how can an LMS and eLearning experiences enhance the tools needed to support virtual teams and help these employees learn in collaborative and informal ways? The world of work has changed. Until recently, workplace learning was an isolated event. Job training experiences took place in a classroom, outside the normal work environment. Today, with so many virtual teams, companies like Cornerstone are offering employees simple, sleek user interfaces and experience that enables learning to be easy and available on demand. In deploying eLearning to virtual teams, content is most effective - and retention the highest - when it is engaging, bite-sized, and addresses both soft and hard skill sets. Social learning focuses on employees engaging in learning modules, i.e. watching a video, then discussing via dedicated online learning forums. Collaborative learning can be driven by virtual employees sharing critical insights and knowledge with their colleagues. Traditional learning methodologies may not always blend with the speed of business, the global nature of our workforce, or the new generation of employees. Collaborative Learning is based on the premise that individuals learn more through sharing and social interactions than they would alone. 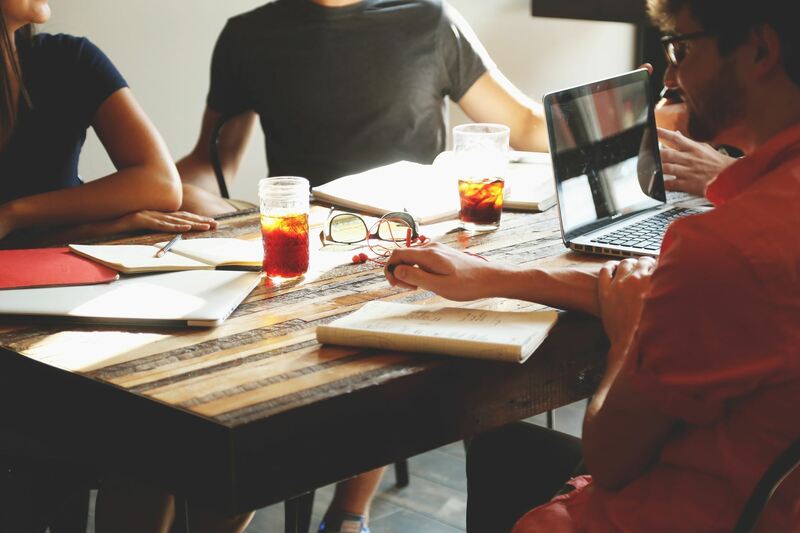 Employees not only learn from each other; they also experience deeper learning through the exchange of information and the varied perspectives of their peers. Critical thinking skills are also heightened and deeper relationships are built between virtual team members. By extending learning into daily interactions, learners can share experiences, stories, and tacit knowledge that is otherwise difficult to capture and deliver through formal learning programs. A collaborative learning program creates the conditions necessary for innovation among virtual teams: connection, feedback, and inspiration. Employees are capable of—and asking for—more from their employers. Studies show they want to be engaged, they want to feel an intimate connection with the workplace. Success today for any organization, in any industry, depends on a new breed of employee. Employees need to be independent and inter-dependent, self-directed virtual team players, eager to lead and to listen. Yet developing the “modern” worker requires more than traditional—or even social—learning methods. Instead, organizations must begin using collaborative learning strategies, learning that unifies work and learning to harness employee knowledge, engage the entire workforce, and solve challenges faster. While creating a successful collaborative learning strategy starts with smart planning, its longevity relies on smart technology. Tools that unify learning, technology, communication, content and social networks, are crucial to both making a strategy operational and ensuring ROI. With the right technology, organizations can drive innovation, improve agility, and establish a culture that values both profit and purpose. In addition to leading Professional Development at American Family, Kimberly designs and delivers a variety of training experiences related to unconscious bias, conflict resolution, team communication, change management, and strategic thinking. People describe her training sessions as high energy, relevant and engaging. 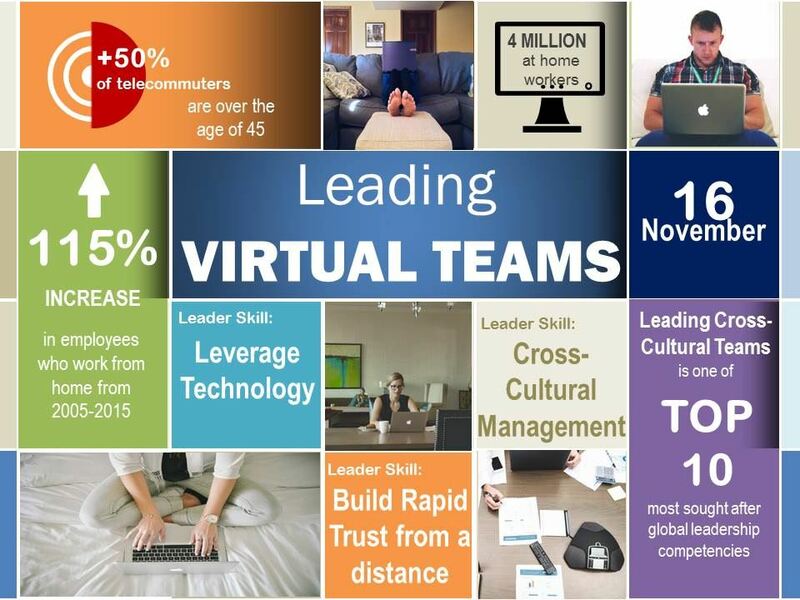 ATD-MAC’s November focus is Leading Virtual Teams. Virtual Teams aren’t going anywhere. In fact, in 2015, approximately 40% of the world’s workforce was remote. By 2020, 62% of employees are expected to work in virtual teams. One of the greatest dangers of leading Virtual Teams is assuming that the same approaches that work for onsite teams will work for your virtual team as well. We had a chance to chat with Lee Johnsen about trends in virtual teams. Lee is the Founder and Principal of Partners in Development. Sign up today to attend ATD-MAC’s “Leading Virtual Teams” presented by Lee Johnsen on November 16th. Q: Lee, in your consulting work, what you have you noticed are the most common misunderstandings about leading virtual teams? Lee: Too often people assume that leading a virtual team is the same as leading a co-located or onsite team. The research supports that there are key differences. Virtual teams require a greater emphasis on team communication, better listening skills, greater emphasis on building trust (from a distance) and more explicit goal-setting, to name a few of the differences. While all teams require sound team leadership skills, high performing virtual teams require additional leader and member skills. Q: What have you noticed are the major trends in virtual teams over the years? Lee: Here are just a few of the changes! Based on a global survey conducted by the American Management Association in 2013, leading cross-cultural teams is in the Top 10 of global leadership development competencies. Additionally, nearly 4 million U.S. employees worked from home at least half of the time in 2015. That represents about 3% of the U.S. workforce—a 115% increase since 2005, nearly 10 times faster than the rest of the workforce. During that same time, the non-telecommuter population grew by less than 12%. (2017 State of Telecommuting in the U.S. Employee Workforce. Global Workplace Analytics.). Finally, half of telecommuters are 45 years of age or older, compared to just 41% of the overall workforce. The average annual income for most telecommuters if $4,000 higher than that of non-telecommuters. Q: In your experience, what are the most important skills for leaders to have when leading virtual teams? While the skills no doubt are familiar, the tactics to apply these skills are different. (e.g. how does a virtual team leader build rapid trust with individuals they rarely seek face-to-face?) In research conducted by the Business Research Consortium in 2013, nearly three fifths of the 1500 respondents said that first-level managers are mediocre or worse as virtual leaders. Leaders of global virtual teams face the greatest challenges as they deal with large differences in geography, multiple time zones, and international team membership. Q: Do you find that there is a certain type of worker or skill set that leaders should look for when hiring a remote/virtual team member? Self-awareness, self-management and relationship management are related to successful team members’ Emotional Intelligence. I would also add Social Awareness, especially in the absence of visual communication. Depending on one’s role and team, some of the other competencies may be more important than others. Q: Even if someone doesn't have work-from-home-staff, it seems like the understanding these principles is important just due to the changing nature of work and connectedness. What ways have you seen these skills translate into "traditional" offices? Lee: Even if you’re not a virtual team member and work in an office onsite, chances are you are a member of a hybrid team. That is, one composed of both virtual and onsite team members. These teams also face some unique challenges. It is not uncommon for onsite team members to envy their remote counterparts because they imagine them working in their sweatpants and doing household chores during the work day. By the same token, remote team members can often feel isolated and out of the communication loop by missing the same socialization opportunities as their onsite colleagues. Virtual team meetings are another common challenge. Today, team members more often participate in more virtual meetings than face-to-face meetings. Yet, engagement is low. In research conducted by the Business Research Consortium in 2013, nearly half of the 1500 respondents said they always or often multitask during meetings. This is especially true of audio-only meetings. Q: Your session in November is focused on Leading Virtual Teams. What can attendees expect? Lee: You’ll find answers to some of the most frequent challenges of virtual teams and how you can support your teams. I would like your input as to what interests you most about this topic and what your experience is as a member or leader of a virtual team. If you’d like, please take a few moments to complete this survey. The results will be shared during my session. Thank you, and I look forward to meeting you in person. Lee Johnsen, CPT, CPLP, SPHR, is Founder and Principal of Partners in Development (PID). Lee has a 20-year record of successfully guiding organizations toward improved productivity and work relationships resulting in significant growth. He has previously held management positions in fortune 500 corporations and has extensive experience working with international audiences. Lee has presented at regional and international conferences (ATD and ISPI) on topics of training evaluation, e-learning, and leadership of globally dispersed teams. He is a published author and an adjunct faculty member of the American Management Association (AMA). In 2014, Lee spent five months working in Saudi Arabia and leading his own virtual team. 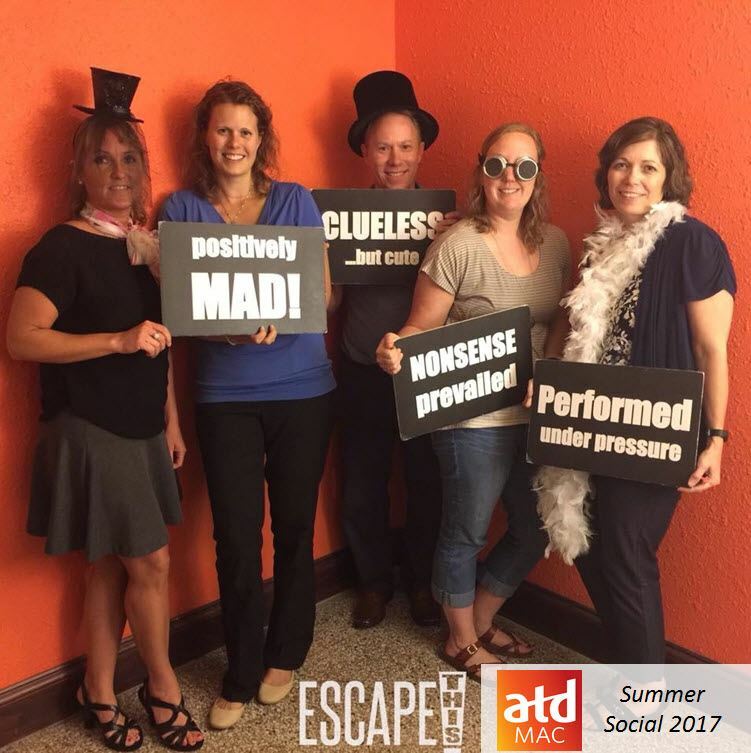 Escape Rooms are creating quite a buzz in the corporate teambuilding space. If you’ve missed this craze, Escape Rooms are a chance for teams to get together, try to problem-solve their way out of a locked room by separating real clues from delightfully tricky red herrings, and also learn about their communication and influencing styles under pressure. The goal is to escape the room in less than 60 minutes. Or . . . is it? As learning and development specialists, the question at the forefront of all our work should always be “What does success look like?” This is not a question to ask as an afterthought; it’s THE question. I hear you; you’re saying “Come on, Erin, the goal of an Escape Room is to escape.” Is it? Maybe success is escaping in 60 minutes . . . maybe 20 minutes. Or, maybe success is learning the names of everyone in the group. Maybe success is asserting my opinion in a group setting at least once. If I am claustrophobic, maybe success is just showing up! One of the greatest errors we make in our profession is assuming that our learners, clients, teams, and colleagues are all defining success the same way. If you want great learning, great outcomes, and great design, start with the question “What does success look like?” and use the answer as a light to illuminate the right action. That way, you aren’t wasting your time on those delightfully tricky red herrings. ATD-MAC’s October is all about understanding what leadership of training teams is all about. Whether you’re already a leader or you’re aspiring toward leadership, we’ve got something for you. We are learning to manage Training Misconceptions as well as Manage the Learning Function in Susan O’Hara’s program on October 18th – it’s not too late to register! 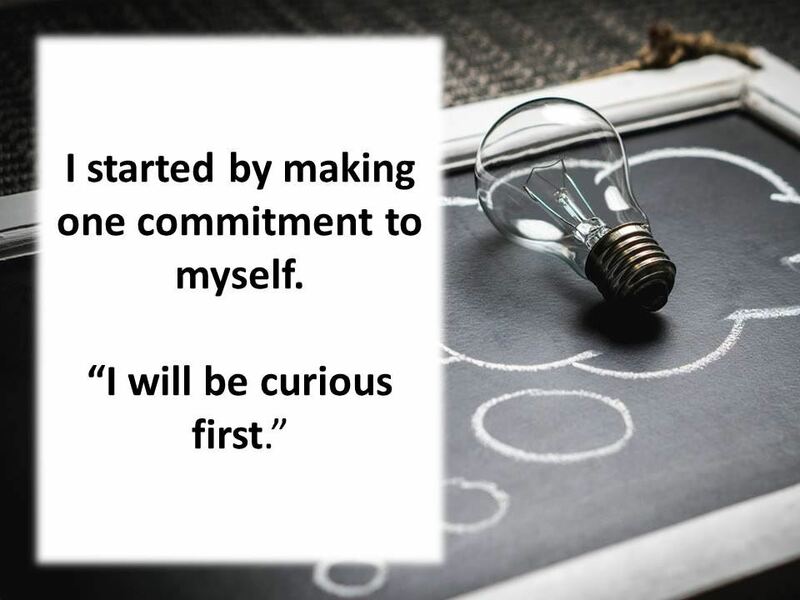 In gearing up for a month on Leadership, I’ve been taking time to reflect on my own leadership journey and all the lessons and turns along the way. When I first started leading a training team, I had what my colleague and fellow ATD-MAC member, Sarah Gibson, describes as Imposter Syndrome. Sure, I’d been in L&D for a decade, but my team was seasoned too – some even had more experience than I did. I kept asking myself, “What could I possible coach or teach that they don’t already know?” I questioned whether I really deserved the training manager title, and whether the title automatically made me a leader. But, I also knew I’d grown complacent as an individual contributor, and I excited for the new challenge of helping to shape a team. What I immediately found is that the team did need me – not just to approve PTO and filter communications from senior leadership – they needed permission and support to try new things. The team wanted to explore new ideas in ILT, but were held back by a company culture entrenched in “sage on the stage,” “spray and pray,” and “death by PowerPoint.” These were things I’d learned not to do years ago. With the support of our director, we began converting lengthy slide presentations into activities and discussions that would engage participants. Because of my past experience, I was able to use this redesign process to coach my staff on the difference between what it meant to be a facilitator rather than a trainer. Guided discovery became the philosophy, and I helped lead the team toward comfort in letting participants struggle, increasing their patience, and learning to spend less time talking and more time listening and answering questions. My leadership came from helping facilitate desired changes and helping remove obstacles that were preventing the change. In my next position, a director position, I also helped facilitate change, but this time the focus was supporting organizational initiatives instead of team-level initiatives. The company was going agile and it was my job to move the department in that direction. While I had the experience necessary, I didn’t anticipate the open resistance to change. While I saw the change as a positive, the team did not, and I saw the approach I used to use as manager stop working. My relationship with the team was strained and sometimes openly adversarial. Again, the Imposter Syndrome set in. I started to question, “Am I ready to lead at this level?” I struggled with why the team seemed to hate me when I’m trying to help them. I wasn’t sure how to balance listening to the team and moving us forward in the direction we needed to go. This balance is what I have struggled with in particular. While time has helped gain trust, it’s sometimes still a challenge to lead when I don’t know the next steps of where the company is headed. Retired Marine Corp General Anthony Zinni talked about leading the charge in Vietnam, sometime up hills with no idea what lay on the other side. He always led the front of the charge and put himself at risk first as they crested the hill. I use that analogy with my own team because sometimes we must operate in ambiguity and move forward into uncertain territory. If there is one lesson leadership has taught me, it’s that while I can’t promise we won’t make mistakes, I can promise I’ll be right there with them when we do. Leading this way has helped me find that balance of supporting the team and organizational initiatives. It’s helping me built trust even when the direction is uncertain. Jacob Burris is a Learning & Development Partner with QBE North America where he works across business units to design and deliver training solutions. He has been facilitating to diverse business groups both nationally and internationally for over a decade. His training career began with facilitating presentations skills to sales teams and grew from there, but his main areas of expertise include: onboarding, customer service, sales, leadership, virtual training, and e-Learning design. Jacob has a graduate degree in Education and an Instructional Design Certificate from UW – Stout. In addition, Jacob is an active member of ATD and has served on the ATD-MAC board since 2015. 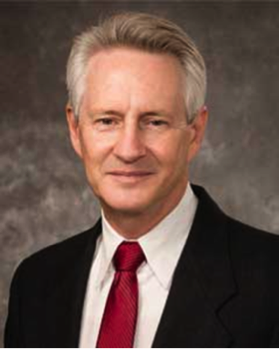 He currently holds the role of ATD-MAC Past President.